This case highlights a number of important points, both in general medicine and haematology. Firstly, the causes of hepatomegaly and splenomegaly are numerous and often not due to a haematological cause. A list is below. A second important point is that fever is usually due to infection, but can be due to systemic disorders. Although our patient didn’t completely fulfil the diagnosis of PUO, in the light of persistent pyrexia and absence of positive cultures, other causes need to be looked into. Because of pancytopenia, hepatosplenomegaly and fevers, the haemophagocytic syndrome was considered. This is formally known as haemophagocytic lymphohistiocytosis. HLH is a haemto-immunological disorder resulting from excessive activation and proliferation of macrophages, T lymohocytes, cytokine storm, inflammation and organ dysfunction. It can be familial/genetic or secondary. Common predisposing/secondary causes include bacterial/parasitic and viral infections (e.g. EBV), malignancy and rheumatological disorders. 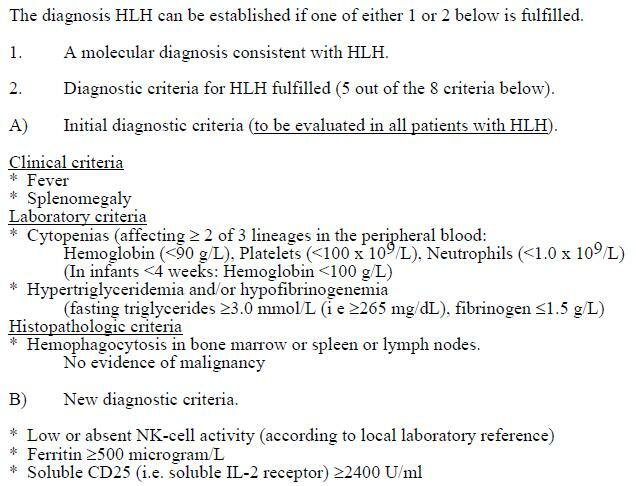 HLH presents with fever, pancytopenia and hepatosplenomegaly. Neurological symptoms can also occur along with signs of hepatic dysfunction such as ascites and jaundice. Peripheral oedema and rashes are also seen. Laboratory findings include pancytopenia, hyperferritinaemia (commonly greater that 5000), hypertriglycerideaemia and transaminitis. If testing available, NK cell levels are low and levels of soluble interleukin-2 receptor (sCD25) are elevated. Bone marrow aspirate and trephine biopsies usually show lymophocytosis and evidence of haemophagocytosis. Similar findings may be seen on splenic biopsy but this is usually not necessary. Molecular markers are also available to aid diagnosis but they do not feature in the diagnostic criteria and are not readily available. Even with appropriate management this condition is difficult to treat and prognosis is guarded with a 50% mortality. Appropriate general supportive measures are key, including blood product support, antibiotics and close monitoring. In this case looking at the serum ferritin was key as this was markedly elevated at greater than 10 000. This should prompt the consideration of the diagnosis of HLH. This entry was posted in Related to other specialities and tagged Fever, Haemophagocytic lymphohistiocytosis, hepatosplenomegaly, pancytopenia. Bookmark the permalink.